People are getting tired of Kelly Osbourne‘s shtick, even if she doesn’t quite realize it. 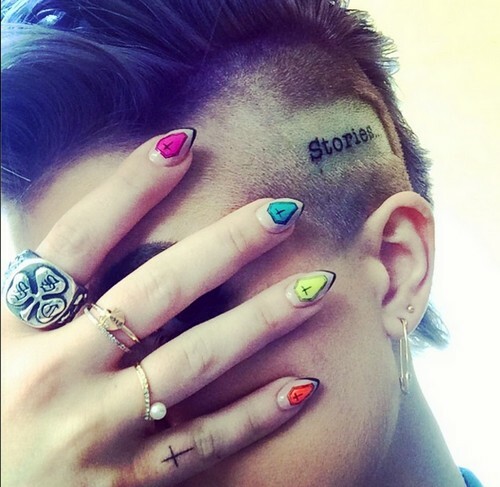 Kelly recently decided to tattoo the side of her head with the word ‘stories’. And before she did that, she decided to dye her hair purple and shave the side of her head. Attention seek much? As IF she cares what her parents think. Kelly’s never cared about their opinions before, so I don’t see why she’d start caring now. Also, why on earth is she advertising this to the whole world? Seriously, getting ‘stories’ tattooed onto your freaking SCALP is not artsy or classy, it’s just obnoxious and weird. And also, ugly. Sorry, it had to be said. It’s also not the smartest place to get a tattoo, not if she plans on regrowing her head ever. But of course, why would we expect Kelly Osbourne to think about all that? Even if we give her the benefit of the doubt in this situation, why would she tweet this out to her followers? For attention, of course. Some people do this kind of stuff for themselves, but people like Kelly Osbourne do it for the increased attention. Then again, she does work with Joan Rivers every week, so if this is the worst she gets, we’ll take it. What do you guys think of Kelly’s new tattoo? Let us know your thoughts in the comments below. Emma Roberts and Evan Peters’ Marriage Opposed By Kelly Osbourne – Fears The Couple’s Too Young!